A collection of 495 seamless 64x64 textures in BMP, JPG, TIF and PNG formats to enhance just about any project you can think of. This collection by RoLoW is suitable for use as desktop wallpaper for your PC, scrapbooking card stock for photo projects, background imagery, or clothing & materials for 3D modeling objects. Uses are only limited by your imagination and the applications used. These textures were created with TaME v2.0 for Windows. This looks interesting. It would be nice if you could post some samples in a larger image size. Even on my 24" monitor, those are difficult to see. You may find these guide helpful as well. Be sure to visit us at www.WINTERBROSE.com. Cheers! They'll come in handy. 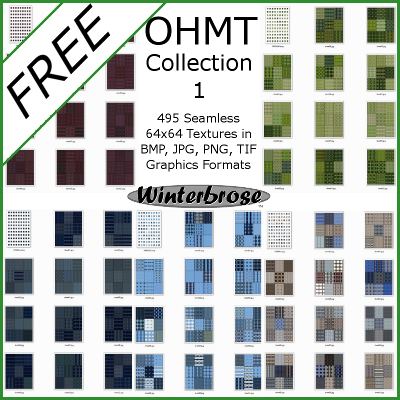 We are happy to announce that OHMTextures Collection 1 is now FREE for both Commercial and Personal Use subject to license agreement found in User Guide.